Last Friday, September 8, was the first home game of our high school football season. Although the schedule is similar to an away game, the crowd’s energy and atmosphere is more ecstatic and welcoming. It also is a little bit more nerve-wracking, since we are at our home field, where we should feel most familiar. Since we are the home team, our marching band performed the pregame show. In some ways, it is better to get the show (and the anxious feelings that come with it) over with, but it is also packs all of those show nerves into a tighter time constraint. I was especially nervous because we were to perform the fourth part of the show, “Music of the Night”, which we learned and buffered the day before. I feared that I would misstep or forget my sets in front of the huge stadium full of my classmates! But as soon as the fear dawned on me, we were marching onto the field to the drum line’s cadence. As we moved in the single file line, I noticed that the field had many holes and why the football team complained and yearned for turf. Trivial questions bombarded my head: what if I tripped and fell? Even worse, what if I tripped and fell during the largest impact of the show? Would people laugh at me? Before I gave myself an anxiety attack, I hurriedly pushed those thoughts out of my mind and jogged to opening set. The show was a blur. I remember awkwardly stumbling once or twice (because of the field or overthinking myself, I am not sure), but nothing that I lost sleep over. The crowd cheered loudly at the end, assuring me that part four went better than I expected. Before I could mull over the details any more, our band director herded us into lines to introduce our football team. 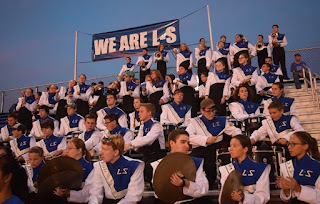 We played our fight song as the team barreled out onto the field, our music competing with the applause from the stands and the hollering of the players. After the introduction of our opponent, Penn Manor, we performed the national anthem and our Alma Mater. We hurried to the stands as the first quarter began. The first half of the game went as expected. It was nice having a bit more leg room compared to the visitor stand at Eastern York, and we had a better place to watch the game. The vibrant sunset, although beautiful, nearly blinded me. Don’t get me wrong, I love sunrises and sunsets, but not when they are shining directly in my eyes. During the halftime show, the marching band stood and watched the Penn Manor marching band’s performance. I enjoyed hearing their pit, since I usually don’t hear ours when we are out on the field. I remembered to cheer similarly to how Eastern York cheered for us: with enthusiasm and the intent to encourage. We had off third quarter, and I wandered around the stadium with my friends, eagerly glancing at the clock to make sure I arrive back at the stands in time. When three minutes were left, I bee-lined back up into the band section, prepared for the fourth quarter. At the sound of the ending buzzer, L-S defeated Penn Manor 25 to 21. 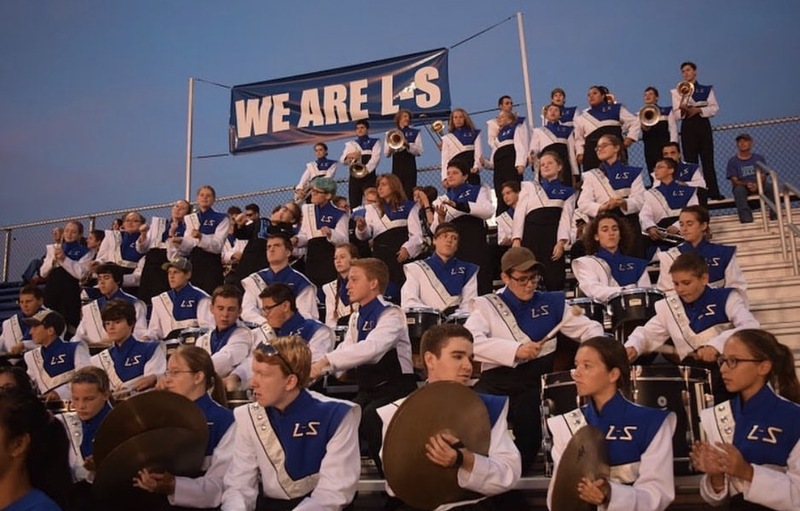 I consider it pretty impressive: our football team is in the early stages of a winning streak, and our band had the first victory in a band-off.